Maps are there to help us get where we need. You can find quite a few of them on our page to help you better understand Prague metro system. Because not everyone knows Prague as well as its residents, it is always better to print the map or to save it to your smartphone. Lines and stations are in green, yellow and red, respectively. Ordinary stations are in the colour of line, transfer station are always in the colours of both lines. Terminus stations is indicated by blank square. Stations with barrier-free access have a depiction of a man in wheelchair in their circle. Tramlines are indicated by a dark red line. Public bus lines to Václav Havel Airport are indicated by a blue plane with the word BUS next to it. If there is a possibility of a transfer to rail lines in a vicinity of a station, there is a blue circle with big white letter S.
Funicular to Petřín is indicated by green picture of said funicular. Public transportation information can be found in stations denoted by the blue square with an I. Park and ride is a light blue square with letters P and R.
Below, you can find maps of individual metro lines. It shows all the station along with their names. This map shows all the 17 stations on the Line A. Two terminus and two transfer stations are also present. This map shows all the 24 stations on the Line B. Two terminus and two transfer stations are also present. This map shows all the 20 stations on the Line C. Two terminus and two transfer stations are also present. 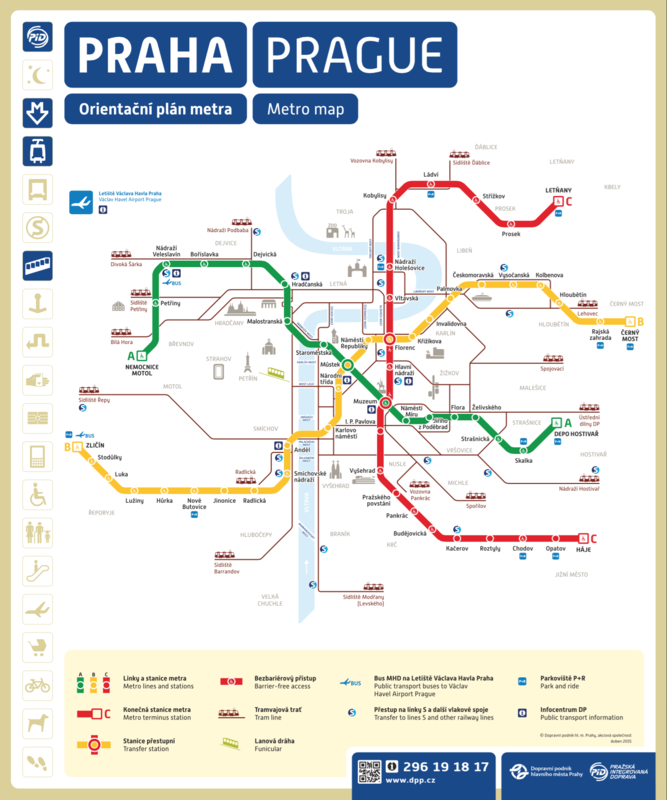 How to download a Prague metro map to your smartphone? The best way to always have an access to map of Prague Metro is to download an app into your smartphone. There are lots of apps for every platforms and we chose the very best for you. We hope this article was helpful and if you have any questions, feel free to contact us. We are happy to help you.